Media captionDiane Abbott: "I had a rather splendid afro at the time. I don't have the same hair style, I don't have the same views"
Diane Abbott says she has changed her mind on the IRA since the 1980s - and likened it to changing her hairstyle. The shadow home secretary was asked by Andrew Marr if she still thought "a defeat for the British state would be a great liberation". "I had a rather splendid afro at the time. I don't have the same hairstyle, I don't have the same views," she said. 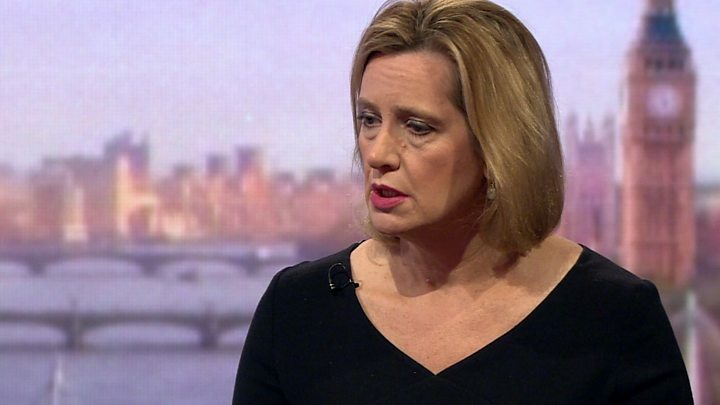 Home Secretary Amber Rudd later said she had changed her own hair many times, but not her views on terrorism. 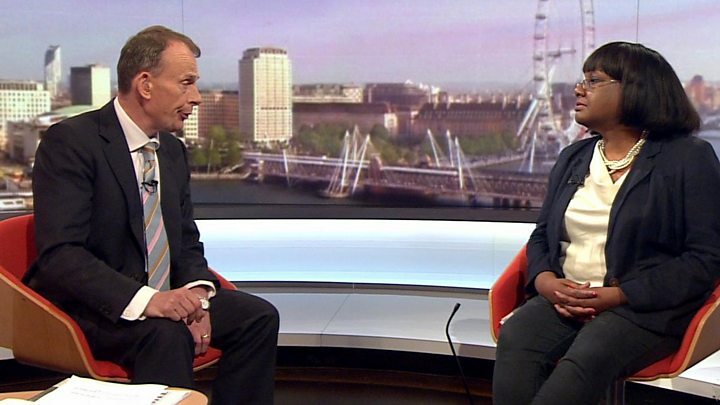 The pair vying to be the next home secretary were interviewed separately on BBC One's Andrew Marr Show about security and terror issues. Ms Abbott had backed an Early Day Motion in 1989 calling for the abolition of MI5, saying it was "in need of reform", but she said she would not do so today because of changes since then. The Labour front bencher said she had voted against one motion proscribing al-Qaeda because it would have also affected dissident groups. And she defended voting against certain counter-terror legislation, saying some of it was "counter-productive" and "nobody votes without a lot of thought". Speaking about the IRA comments, Ms Abbott said they were made 34 years ago she said: "The hairstyle is gone, the views are gone." Media captionAmber Rudd: "I have not changed my view about how we keep the British public safe"
Ms Rudd said of her Mail on Sunday interview - where she claimed more people would be killed by terrorism if Labour was elected: "Look at the evidence - Jeremy Corbyn, Diane Abbott and John McDonnell all have a history of opposing terrorist legislation." And referring to her rival's comments, Ms Rudd said: "I have changed my hair style a few times in the last 34 years as well, but I have not changed my view on how we keep the British public safe." In a later interview with Robert Peston, the Labour leader Jeremy Corbyn was asked whether Ms Abbott was trivilialising serious issues by likening her views on the IRA to hairstyle changes. He said "Diane's hairstyle is a matter for Diane" but added that "we learned - all of us - a lot" as a result of what happened in Northern Ireland. And asked whether he still appoint Diane Abbott to be home secretary if Labour won the election, Mr Corbyn said she was the party's home affairs spokeswoman and that: "I am looking to appoint our shadow cabinet."